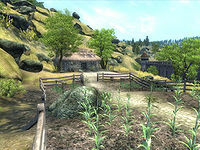 Whitmond Farm is a farmhouse north of Anvil (quest-related). From Anvil, go right at the first fork in the road north of the main gate. It is currently home to Maeva the Buxom, who will ask for your help in reclaiming a family heirloom that was stolen by her estranged husband. Outside of the farm there is a small near-symmetrical vegetable patch. On one side are six potato plants and thirteen corn stalks. Four potato plants, an arrowroot plant, and twelve corn stalks stand rooted on the other side of the vegetable plot. A clutter barrel sits next to the fence gate and three more stand next to the farmhouse door. The farmhouse itself is a typical lower-class dwelling. On the dining table in the northern side of the house, two cheese wedges, two onions, two loaves of bread, and a piece of mutton rest on clay tableware. An open chest with a potion of agility sits between a chest of drawers and an unlit fire place. Four food storage barrels and three sacks with clutter rest against the back wall. A clutter chest, two bottles of beer, and a bottle of mead can be found among clay ware in the southern corner. For her protection, Maeva keeps a sturdy steel warhammer tucked into the corner between the wall and the drawers. All containers respawn except the three sacks, although these shouldn't be considered safe for storage as Maeva may decide to make use of anything stored in them. When the Vow Breaks: Recover the family heirloom for an abandoned wife. This page was last modified on 25 March 2017, at 16:52.